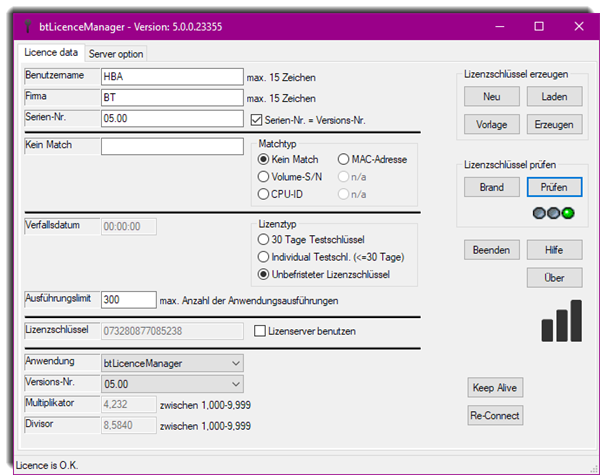 btLicenceManager is an easy to use licence manager that creates secure licence keys to protect your software against piracy. The Licence Manager generates and check former created licence keys to their correctness. Former created licence keys may be reused for further activities like do some changes. It will be distinguished between full, time limited and try licence. The licence key may created hardware dependend or hardware independend. A functional library (COM API) can be used for several Mirosoft Visual Studio .NET applications (VB and C#). Some code examples are part of this delivery and make it easier for implementation. Intuitive license manager take fast access to important functions.